If you're here, it's because you love the cars of the GASSER Era. Maybe like us, you grew up attending Sixties drag races where you watched in awe as "Big John" Mazmanian's gorgeous candy apple red coupe staged against Stone, Woods & Cook. We got hooked on Gassers at that time and maybe you did too. You don’t have to own a race car or rod to be in the club. All you have to do is love Gassers. 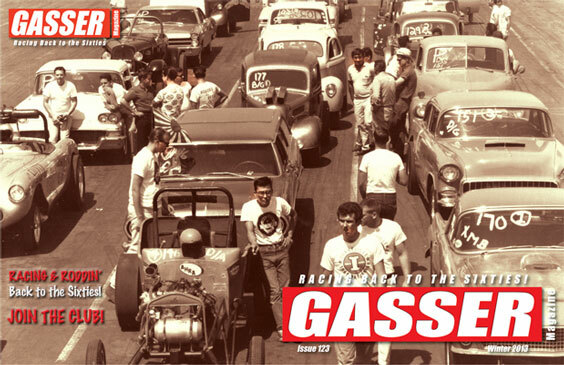 Gasser Magazine™ is arguably the best member-supported car club magazine in the world. Members submit the articles and pictures. 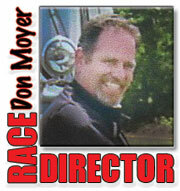 Membership includes a membership card, decals and a subscription to the first and best Gasser magazine in the world. Members advertise in the Swap Meet section for free. Who knows, the car of your dreams may be in the next issue. What continues to amaze me are the barn finds. 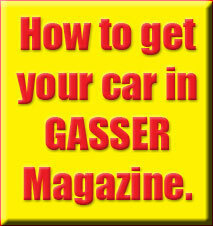 Guys keep discovering old GASSERS in garages and barns. My brother found his in an airport hangar. It had been parked there right after its last race in 1967. The ‘41 Willys coupe was dusty but untouched and complete. They're still out there. We’re a car club but what we really are is a group of guys and gals who love the cars and stars of the Sixties’ GASSER scene. While Willys were the superstars, the Anglias, Austins, Model A’s, early-to-mid '50s Chevys and more filled out the Gasser staging lanes - - just like they do at our club events. If you haven’t been to a GASSER Reunion™ or GASSER Nationals™, make plans to attend one. You’ll love it. You may even get to meet a GASSER Legend like Ohio George Montgomery, Big John Mazmanian’s driver - Bones Balogh, or "Isky" from world famous Iskederian Racing Cams. Join the club, you'll be glad you did. The publication is published with the understanding that the information presented is from many sources from which there can be no warranty or responsibility by the Publisher as to accuracy or completeness.